Arbitrage - What Does It Mean? 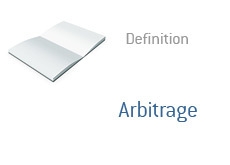 What is the definition of arbitrage? What exactly does arbitrage mean? Arbitrage, as it applies to the stock market, occurs when a security is purchased on one market and immediately resold on another to take advantage of a discrepancy in the prices. Let's take a real-life example to demonstrate exactly what arbitrage is. Example: You swing by your local comic book store and notice that there is a mint version of the first ever Spiderman comic available for purchase for $5,000. You drive to a second comic book store in town and talk to the manager of the store. He informs you that he will purchase a mint-condition, Spiderman #1 for $5,500. You purchase the comic at Store #1 for $5,000, only to immediately walk down the street and sell out to Store #2 for $5,500. This is arbitrage. This was a zero-risk transaction for you. You took advantage of a pricing discrepancy to bank an immediate short-term profit that technically held zero risk for you. You didn't care at all about the true value of the Spiderman comic book, and you certainly had no intention of holding on to it. You simply took advantage of the fact that Store #2 was willing to pay more for the comic than what Store #1 was selling it for. Was Store #1 pricing the comic too low? Was Store #2 willing to pay too much for the comic? This is irrelevant to you, as you booked your profit with zero risk. John Meriwether - Third Time's A Charm?